Moist salmon with a lovely crunchy coating. If you don't want to make the greens, keep it simple and serve with some crusty bread and salad instead. Place the couscous in a heatproof bowl and stir in the ginger. Pour 100ml hot water over, season and set aside for 10 minutes, then fluff up the grains with a fork. Sit the salmon skin-side down on a chopping board and press the couscous onto the salmon, flesh-side only. Heat the oil in a large frying pan. Carefully add the salmon, couscous-side down. Reduce the heat a little and cook over a gentle heat for 3-4 minutes, until the couscous is golden and crusty. Turn the salmon and cook for a further 4-5 minutes, until just cooked through. If necessary, keep warm in a low oven while you finish the greens. Heat the oil in a wok or large frying pan and add the garlic and chilli. Infuse over a gentle heat for a few minutes, then increase the heat and add the greens and a splash of water. Cook for 4-5 minutes, stirring, until the greens are just tender. 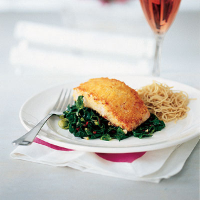 Serve with the salmon and some egg noodles.